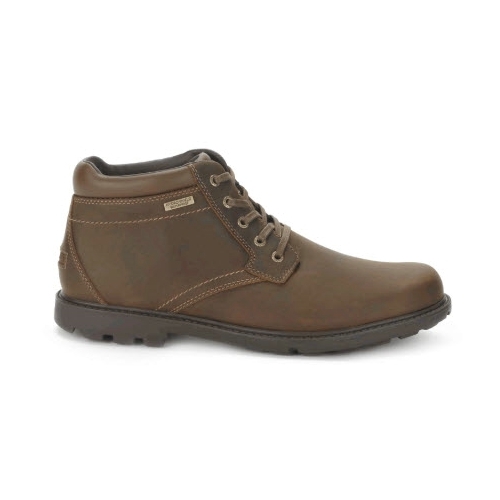 The Rugged Bucks Waterproof Boot is a lightweight men's boot that is built with a flexible architecture, combined with an outdoor-friendly design. The EVA outsole helps provide traction and shock impact, while Rockports Hydro-Shield construction offers waterproof leather, a seam sealed, waterproof insole, and a gusseted tongue to help keep feet dry. With a combination of truTECH sport technology for shock absorption and truTECH+ for forefoot cushioning, these are some of the most comfortable men's outdoor boots available. Whether you are trekking through downtown streets or forest trails, you are sure to be stylish and comfortable. Rockport's truTECH technology is a lightweight comfort system that provides shock absorption at the heel. truTECH+ for all day comfort and forefoot cushioning. Hydro-Shield construction offers waterproof leather, a seam sealed, waterproof insole, and a gusseted tongue to help keep feet dry. Waterproof materials help keep feet dry and are easy to clean and maintain to extend product life. TPR outsole for durable shock absorbency to help reduce foot and leg fatigue and helps provide sole traction. EVA footbed conforms to the shape of the foot for a personalized fit.